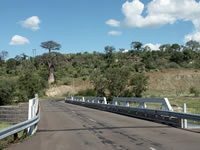 The African Development Bank (AfDB) Group has approved funding of US$110 million for the construction of the Trans-Gambia Bridge and Cross Border Improvement Project. The financing package, which is being extended through the African Development Fund (ADF), the African Development Bank Group’s concessionary lending window, comprises an outright grant of US$100 million and ADF concessionary resources of US$5million. Phase I will consist the construction of the Trans-Gambia Bridge over Gambia River and One Stop Border Posts (OSBPs) while Phase II comprises of rehabilitation of 137 km of Senoba-Ziguinchor road in Senegal and pavement strengthening of 24 km of Farafenni –Senoba road in The Gambia. The project will be completed in five years, from 2012 to 2017.